Whether you call them footless socks or calf sleeves, compression garments can help boost and reinvigorate legs by encouraging proper blood circulation… but these Atom Milk Compression Calf Sleeves bring something fresh to the table… and that is Lanati milk fibre, made from actual drinking milk! Innovative, luxurious and skin-loving, these remarkable products are British conceived, US designed and Italian made with a milk protein-based mixed fabric that is breathable, moisture wicking, sanitising and anti-microbial. Don't mistake moisture wicking for ‘drying out’ though - the milk fibre moisturises skin while unhelpful sweat is moved away from your legs to evaporate away. 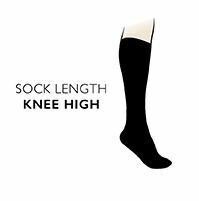 These silky-feeling Atom Milk Compression Calf Sleeves keep working while you do, all day long as you go about life, caring for your legs and providing graduated compression at 18-22mm Hg, British Standard Class II. Compression doesn't mean ‘constriction’, so soft, stay-put comfort cuffs to the top and bottom on the sleeves provide hold without unwanted tightness and pressure. Wearing footless sleeves allows you to go barefoot, or team the benefits of Atom Milk Compression Calf Sleeves with your preferred foot socks.